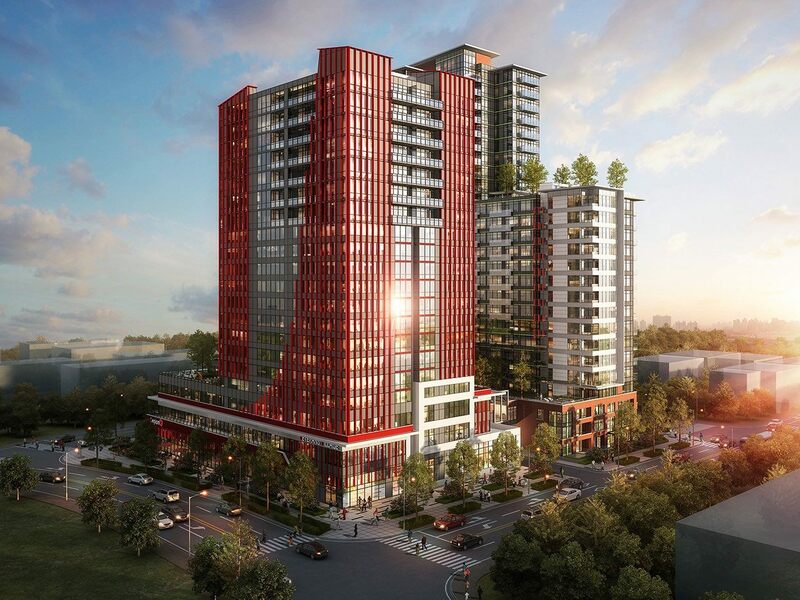 New renderings were released this week of Lark Group’s upcoming ‘Veteran’s Village’ project – set to replace the existing Whalley Legion at 106 Ave & City Parkway. This latest design is the 4th redesign to be released publicly since the project was first announced back in 2015. Initially, in 2015, the project was to feature twin towers resembling the Vimy Ridge Memorial in France. The design, by Michael Green Architecture, was noted to be conceptual at the time, and later proved to be a bit ambitious of an undertaking for the project. 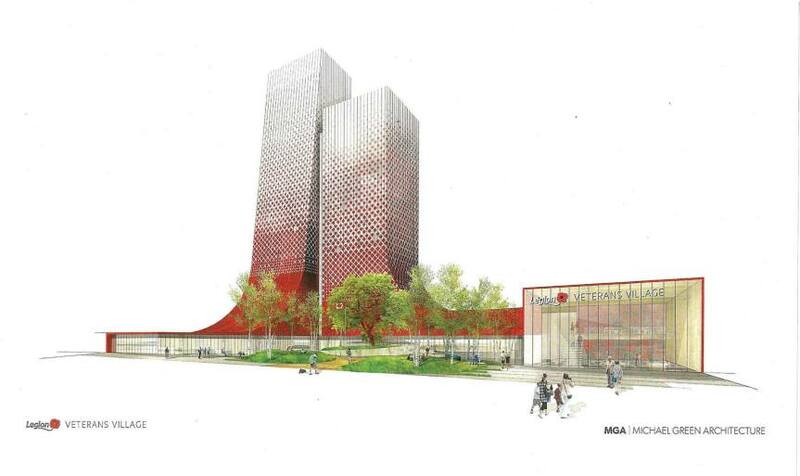 In late 2016, a new design was revealed for the project, scaling it back to a single building of lesser height, and less iconic of architecture, yet still featuring reference to the Vimy Ridge Memorial, and situated on a site surrounded by expansive plaza space. A year later, in November 2017, an application was finally submitted for the project, but based on yet again, another redesign. This time, the project appeared to be scaled back even more. Much of the plaza space depicted in early designs had been eliminated, and the building’s architecture further simplified. Now, as of April 2018, a radical redesign has been released, showing a return to a 2-tower project, with a much more iconic, urban, and architecturally forward design. The tower has retained its reference to the Vimy Ridge Memorial through a creatively designed facade, and now fills out the block that it occupies in a much more urban form. Wide sidewalks are depicted on both City Parkway and 106 Avenue with double rows of boulevard trees – in what looks to be intended as a quasi plaza space at the base of the tower, integrated with the sidewalk. The tower heights have also changed – with the main tower depicted at 21 storeys and the tower behind at 27 storeys. A multi-purpose facility designed as a centre of excellence in clinical and rehabilitation services for Veterans and first responders, with a mix of social and affordable housing. It will include space for research and delivery of health care programs, services and trauma counselling to address issues like PTSD. It will also provide clinical spaces to advance evidence-based services and programming in health, science and engineering, including innovations in robotics, assistive devices and exoskeletons for injured Veterans and first responders. Further to news earlier this month on the moving forward of the Veterans Village Project, on the site of the Whalley Legion, more details were released late last week showing a major re-design of the project. The previous concept prepared by Michael Green Architecture for a twin-tower development has since been replaced by a single, ‘stepped’ tower concept over what appears to be a 2-storey podium. 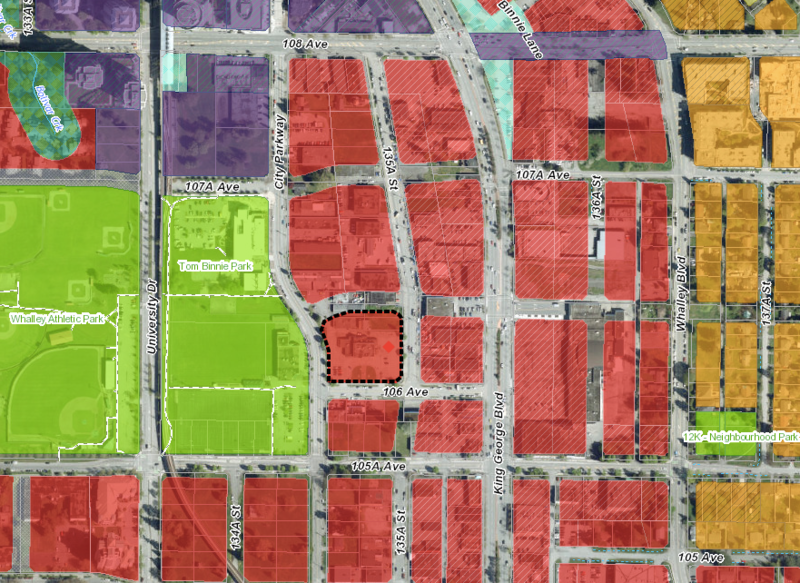 In addition, a large portion of the site is shown to be dedicated as an open plaza/park space, forming what would be Surrey’s equivalent to Victory Square in Downtown Vancouver. 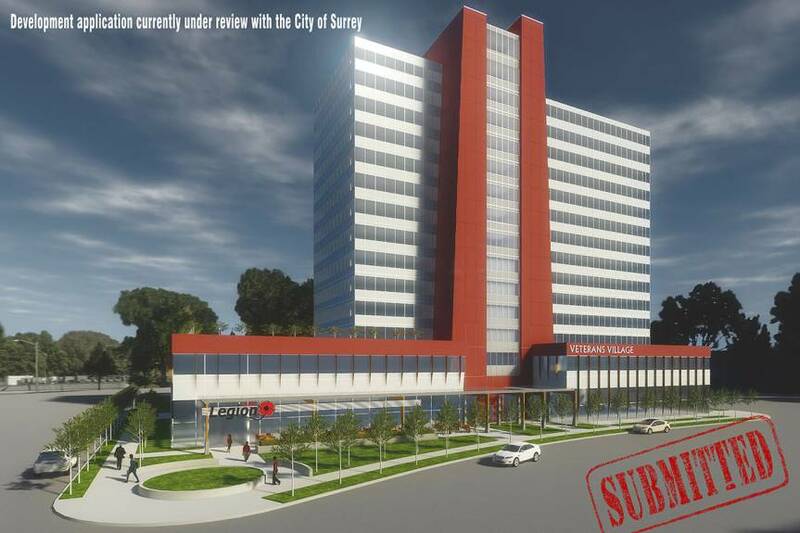 The proposed plaza would provide a new space for Remembrance Day ceremonies in Surrey and serve as a permanent memorial space. Despite the reduced scope of the project from a twin tower concept to a single tower, the project continues to take design inspiration from the twin tower Canadian National Vimy Memorial in France. 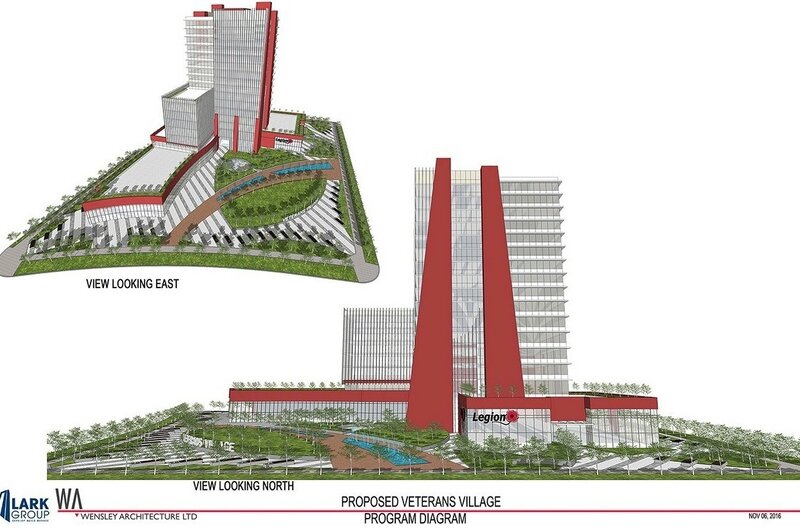 As depicted in the concept, the tower features 2 red decorative beams running up the height of the tower, reminiscent of the memorial. Still no confirmation on height, however a Surrey Now article mentions a height of between 16-28 storeys. While no application has yet been submitted on the project, the developer Lark Group, hopes to begin site preparation and construction by as early as Spring 2017. The project is said to still be seeking funding sources, some of which could come through Federal Infrastructure funding, currently being lobbied for.